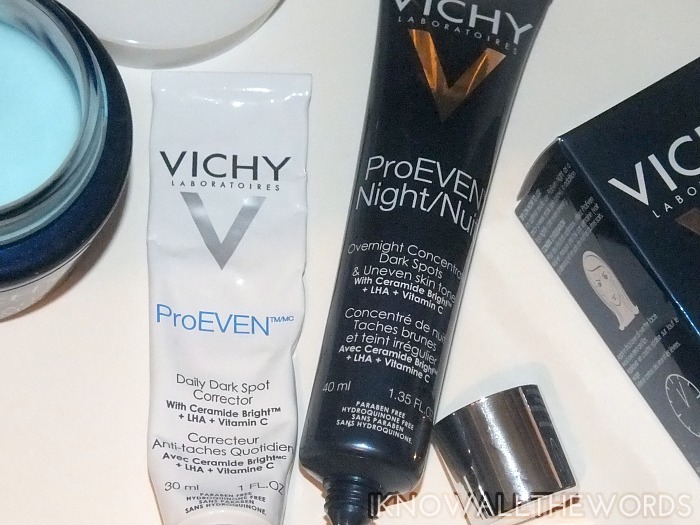 The nighttime is the right time, especially when it comes to skincare. We all know sleep is vital to keep us healthy and happy- or at the very least a non-murderous-crabby-pants ( I don't do so well when I don't get my full eight hours...) But, our skin needs it's down time as well. While we're off in dream land, our skin is at work repairing, regenerating, and a whole host of other 're' words I'm sure. That said, it only makes sense to give skin everything it needs so you can wake up with the gorgeous complexion of your dreams- see what I did there? 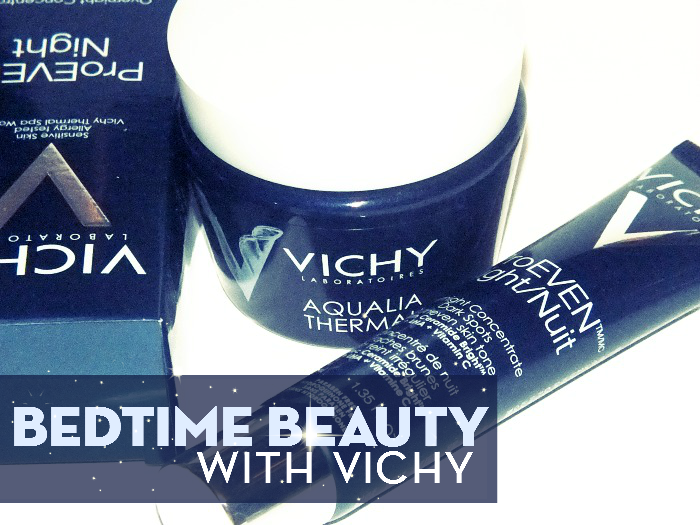 Two overnight products I've been loving are Vichy Aqualia Thermal Night Spa and Vichy ProEven Night. Read on for the 411! 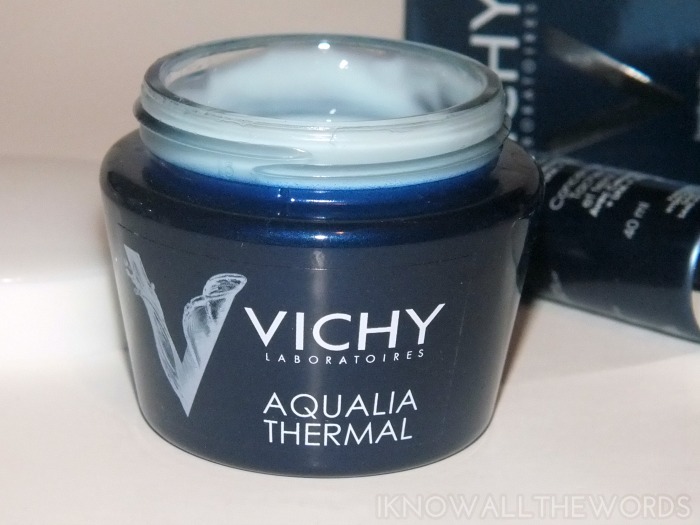 Vichy Aqualia Thermal Night Spa might look like your average gel-cream moisturizer, but it's so much more. It's a moisturizing mask- used one or two times a week- to deeply moisturize and sooth skin. To use, it's as simple as any other moisture mask, as you apply a thick-ish layer, leave it on for about ten minutes, then tissue off any excess. The cream has a fresh, aquatic scent, that is mild and quite pleasant, and adds to the whole spa like feel while waiting for the mask to absorb. I'm always amazed at how much of this my skin absorbs each time I use it... It works immediately, as skin does feel softer and smoother right after removing it, but it really works it's magic overnight. Upon waking skin is at it's ultimate softness, with a smoother, brighter, and fresh and plump. Basically, your best skin day, ever. 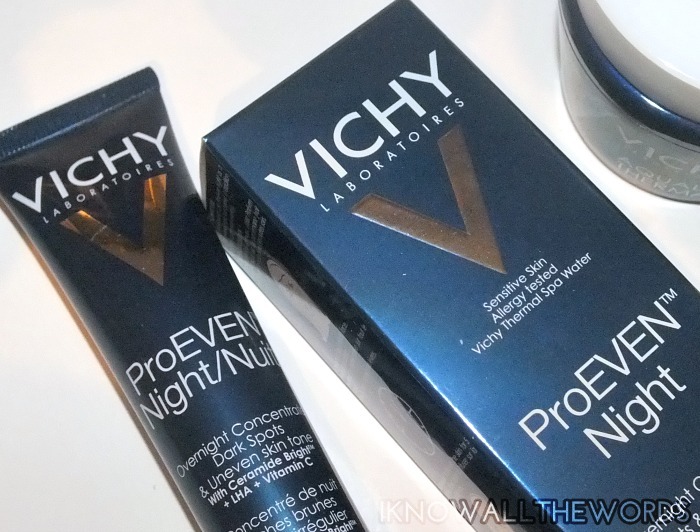 Vichy ProEven Night takes off where ProEven left off, as the night version is a supped up concentrate. ProEven Night works to not only diminish dark spots, but it also works to resurface skin leaving it smoother and brighter. Like the original ProEven, the night version is formulated with Vitamin C, Cerimide Bright Complex and LHA- but, it has 3x the amount! The interesting aspect to ProEven Night, is that in addition to using it as your typical spot treatment, you can also use it as a mask by applying a thick layer and leaving it to absorb for about five minutes and tissue off. As a mask, I use this once a week but it's especially great when my skin is looking dull as it gives skin such a boost. While you see the most change after a few weeks, there are immediate results- which you can't help but love- such as waking up to a brighter, smoother, resurfaced skin. Over time, I noticed spots reducing and my skin-tone looking more even. I find any blemish tends to leave a pretty predominate mark on my skin (that lasts way longer than I'd like, too) but if I apply this as soon as the spot starts to form it starts to fade much quicker than if untreated. Overall, these are two excellent additions to any nighttime regime. Tried these? Do you have any must have bedtime products? Do share! Mary Kay Mineral Eye Colour - New Shades!